With the 2011 Session around the corner the Governor and Legislative Leaders have been announcing their policy platforms for the upcoming session. With everything from a sportsman's bill of rights to immigration reform on the minds of policymakers, the real question remains....What will they accomplish? Beshear wants limited agenda for legislative session does a good job of laying out the top priorities for Governor Beshear...Medicaid budget corrections and raising the dropout age. House Democrats are caucusing in Frankfort this week though no formal announcement of their platform has been made, however the Chamber heard House Speaker Stumbo's legislative priorities at a meeting earlier this week. Senate Democrats caucused earlier this week, though no platform has been announced yet this was up on their website: Democrats moved Kentucky forward, renewing our commitment to improving education, safeguarding our youth, promoting energy independence, creating and keeping jobs and protecting Kentucky’s small businesses through tax relief and improved health care. The 2011 General Assembly session will begin in January with the ever-important Organizational Session where the legislature will elect leaders, appoint Committee Chairs, and assign members to committees. Although most of this will not be official until the first week in January some of the Caucuses have made a few announcements. House Democrats - Won't finalize their organization until the first week of the session, but their may be some contested leadership races Former House Speaker Jody Richards reportedly to challenge Larry Clark. 1. These increased revenues were budgeted for, meaning that there really isn't any surplus, revenues are only slightly ahead of budget. 2. In order to meet the General Fund budgeted revenue projections, revenues have to increase 3.7% more by July 2011. 3. There is almost no way the Road Fund will not beat the budgeted revenue estimate, it only has to grow 0.4% more in the next 7 months. U.S. Sen. Mitch McConnell has named Josh Holmes, who heads the Senate Republicans’ communications center, as his next chief of staff in his his Washington, D.C., office. Holmes will take over for Billy Piper, who is leaving at the end of the month to join a Washington lobbying firm after serving as McConnell’s top aide since 2002. Sen.-elect Paul announces staff appointments: U.S. Sen.-elect Rand Paul, R-Bowling Green, announced several appointments Tuesday to his official staff. Fischer begins shaping administration with 8 appointments: "Louisville Mayor-elect Greg Fischer gave a glimpse into his new administration Friday, naming a diverse group of people to eight key positions." Mayor-elect Gray names transition team: "Lexington Mayor-elect Jim Gray announced Tuesday the process he will use for his transition into office, and he named leaders of a team that will help make it happen." With the new year approaching we will be posting more...stay tuned. Check out this Google Maps gadget that ranks the various U.S. Senate & Congressional races across the country and in Kentucky. The state revenue report for the month of August was released today, you can download a pdf copy HERE. In August the General Fund rose 3.3% and the Road Fund was up 9.5% as compared to August a year ago. This is the second month in a row of revenue increases for both funds. In terms of the General Fund the numbers can be a little deceiving, because revenues were budgeted to increase during this fiscal year by 4.2% and so far the increases haven't kept track with the budgeted amount at only 3.9%. Although this is a small discrepancy, another revenue shortfall will follow if revenue growth isn't stronger the rest of the fiscal year. The Road Fund is in an altogether different situation. The official Road Fund revenue estimate in the budget called for growth of 4.9% in this fiscal year, and due to an 11% growth so far this year, revenues are actually ahead of the budgeted estimates. Revenue growth in the fund has been driven by an 18.9% year to date growth in motor fuels taxes. As the the Federal Health Care reform legislation begins to take shape there will be a significant role for state's to play. A large piece of the puzzle to achieve universal coverage is Medicaid, which is a Federal program that is administered by the states and the states share in the costs of the program. The match rate for Kentucky is approximately 20% after adjustments made by the Federal stimulus monies, normally the match rate would be closer to 30%. This is generally a good deal for the states, because of the high Federal participation. But as the Medicaid rolls grow, due either to the poor economy or the Federal health care reform and their expanded eligibility for the program, the costs are going to go up for states. Kentucky will not be immune to those increases and with the current budget situation as an example of how cash-strapped Kentucky is, it is likely that we will have trouble meeting the increased costs of the Medicaid program going forward. Kentucky Medicaid is a nearly $6 billion program, so meeting the Federal Stimulus 20% match at the state level is over a $1.2 billion proposition. Not to mention if the match rate goes back up to pre-ARRA levels. As the program grows that cost will as well. Here are a couple of articles on the potential increases in enrollment and how they could impact Medicaid. Report: Number of Kentucky Medicaid patients will surge: (Herald-Leader) "The number of Kentucky residents with Medicaid coverage could shoot up by nearly 424,000 patients by 2019, and the federal government will foot most of the cost of their treatment. The Kaiser Family Foundation on Wednesday released a study projecting nationwide increases in Medicaid enrollment over a five-year period beginning in 2014, when most provisions of the health care reform bill will take effect. If Kentucky aggressively pursues enrolling new Medicaid patients, the percentage of uninsured low-income adults in the state would drop 77 percent, versus a 69.5 percent drop in the number of uninsured people nationally. The state also stands to get a slightly larger than average share of its Medicaid expansion paid for by the federal government 95 percent of the costs of covering newly eligible Kentuckians from 2014 to 2019, versus a national average of 92.5 percent. The study estimates that if states actively sought to enroll additional Medicaid patients the uninsured and those earning up to 133 percent of the federal poverty level the federal government would pay $531 billion of the additional health care cost, with states picking up $43 billion." Health care reform's X factor: (Stateline.org) "
Nobody knows for sure how much expanding Medicaid will cost the states because it's impossible to say how many new people will sign up for the program. A new study says that new enrollments, and their associated costs, could run much higher than many states expected. " Six incumbent state Senators had primary opposition today and all six won their primary elections. Although every race has its own dynamics sometimes there are state or national themes that can play a role to varying degrees in these races. The three themes that many thought might be at play in these races were anti-incumbent sentiment, the Tea Party movement, and the issue of expanded gambling. Anti-incumbent sentiment seems to be running high in politics at all levels this election year, yet all of these incumbent state senators won tonight. All of them won by nearly 70% or more of the vote with the exception of Sen. Buford who narrowly won by 700 votes. At least for this primary election the anti-incumbent sentiment didn't seem to play a role, but the general election may be another ball game. The Tea Party movement has been well documented due to Rand Paul's candidacy. It may be the reason that several of these candidates decided to run for office in the first place. However, it did not seem to be a huge factor in these State Senate Races. The issue of expanded gambling was an issue in a couple of these State Senate races. In the 12th district Sen. Kerr opposed expanded gaming in the Senate and her primary opponent was a Republican in favor of expanded gaming. Sen. Kerr won with 71% of the vote. In Sen. Buford's case, he supported expanded gaming during a special session last summer and his opponent was supported by conservative anti-gaming interests. Sen. Buford won his primary, but it was the closest of the state Senate primary races. This issue will continue to be an issue in Kentucky elections this Fall as well. There are two open seats for the State Senate, to replace the retiring Senators Tapp (R) and Worley (D) and the voters chose their nominees to run for these seats in the Fall. In the 20th district to replace Tapp, Democrats chose David Eaton, former Shelbyville mayor, and Republicans chose Paul Hornback, a farmer that has been endorsed by Tapp. In the 34th district to replace Worley, Democrats chose Lee Murphy, who received Worley's endorsement and owns a local technology company, and Republicans chose Jared Carpenter, who is a local banker. Fourteen incumbent State Representatives had a primary election today, five Republicans and nine Democrats. Twelve of the Fourteen incumbents won their primary elections, two were defeated Rep. Charlie Siler (R) & Rep. Ancel Smith (D). Rep. Siler (R) appears to have been beaten by challenger Dewayne Bunch by 123 votes. This was the third race between these two, Siler won in 2006 by 3000 votes and in 2008 by a much narrower 600 votes. Rep. Ancel Smith appears to have been beaten by John Short in the Democrat primary by less than 600 votes. Ruby Couch the Republican will face John Short in the Fall. In terms of very brief analysis it appears that there was not a huge anti-incumbent sweep in state House races for this primary election. Its hard to know what factors may have been at play in these races at this point, but we will look to bring you that information in the days ahead. The proposal offers what the Governor described as a blend of the House and Senate versions; however, it appears to be most of the Senate version. It includes no new taxes and maintains certain spending priorities rather than across-the-board spending cuts. The Governor outlined priority agencies as all of education, state police, prosecutors, economic development, natural resources, Medicaid and other public health agencies and the corrections system. For all agencies other than the priority agencies, he is proposing a reduction of 3.5% in 2011 and 4.5% in 2012 compared to the 2010 budget. The priority agencies will receive something less than that. The Governor is also proposing a biennial budget as is required by the constitution and as was included in the Senate proposal. He also includes efficiency goals in both 2011 and 2012 that were included in his original budget. The structural imbalance is also reduced by approximately $400 million. He includes a carry forward of $279 million in the second year to mitigate deeper cuts. The Medicaid proposal is as proposed by the House, but includes cost containment measures that were included in the Governor's original budget. In answer to a question on what other items he may include in the call his reply was only those items where there is an agreement between the House and the Senate. He reiterated that point throughout the press conference and at one point stated he would love to have the unemployment insurance bill included in the call but would not do unless there is an agreement. For now, the only items on the call are to be the budget, road plan, and what was agreed to by the House and the Senate in the revenue bill (HB 530) that was proposed in the House. It does not include any new taxes or any new recurring revenue. Here is the video from Governor Beshear's Press Conference on the Special Session and his budget proposal. The 2010 Primary Election is just over a week away and will be held on Tuesday, May 18. This year will be a big election year particularly for the Kentucky General Assembly as all 100 House Members and half of the state Senate Members, 19 of 38, are up for re-election. As we shared back in January after the candidate filing deadline there was a large number of candidate filings this year as 232 people filed to run for these 119 seats. Now with the primary deadline approaching we wanted to give you on overview of these primary races and the dynamics that are at play. Federal races normally don't play into local legislative races in Kentucky. This year could be different with the darling of the tea party movement, Rand Paul currently leading in the Republican US Senate primary against the establishment candidate, Secretary of State Trey Grayson. If Rand Paul wins the primary, his support will strengthen and the money will flow in from around the country. It could mean tough times ahead for incumbents in the general election in November. It could also mean attacks on the upstart from more moderate Republican corners. We hope this helps set the stage for election day on Tuesday and then also looking ahead to November. We will send a break-down with the outcomes of Tuesday's election and will keep you updated through the summer and fall, leading up to the general election. The Senate Republicans hold a 20-17-1 majority. The one independent caucuses with the Republicans and serves as Chair of the Senate Budget Committee, so it is essentially a 21-17 margin. Last summer the Democrats made a run at taking the Senate back after the resignation of Senator Charlie Borders (R) and subsequent special election of Senator Robin Webb (D). Then Senate Majority Floor leader Dan Kelly was poised to resign and accept a judgeship and if the special election to replace him produced a Democrat, the margin would have gone to 19-18-1. Some Frankfort pundits predicted that if Kelly's seat went Democratic there would be more resignations or defections and Senator Williams could be in danger of losing his Republican majority and position as President. Kelly did resign, but Jimmy Higdon, now Senator Higdon, won easily and boosted the Senate Republican majority and stymied the Democrats efforts to take the Senate and remove President Williams. Now with a full slate of legislative elections in the Senate this year, the balance of power is once again up for grabs. This election cycle there are 19 senate races up with 17 being contested in either the primary, general or both. Only Senator Higdon's and Senator Dorsey Ridley's seats are uncontested. Of the 17 contested seats, currently the Republicans hold 10 and the Democrats hold 6 and the 1 independent Bob Leeper. Two of the 17 seats are open seats, (Worley (D) and Tapp (R) retired). In the 15 seats that are currently occupied by an Incumbent, 6 of the incumbents have a primary election, 5 Republicans (Kerr, Harris, Denton, Buford,Williams) and one Democrat (Palmer). The Democrats hold a substantial 65-35 majority in the House, but their substantial majority also means they have more at risk in the fall elections. There are 58 of 100 State House seats contested in either the primary or general elections, incumbents occupy 54 of those seats. There are 5 open seats created by retirements, but only 4 of those are contested, Sara Gregory (R) replacing Rep. Upchurch did not draw an opponent. 14 of the incumbents have a primary election, 5 Republicans (Napier, Koenig, Siler, York, Turner) & 9 Democrats (Gooch, J.Lee, Riner, Henderson, Edmonds, A.Smith, Combs, Overly, R.Adams). The real story in the House is that of the 58 contested seats, currently the Republicans hold 13 and the Democrats hold 45. This is a large number of seats for the House Democrats to protect, particularly if any or all of these factors are at play this Fall: the national political scene leans conservative, the tea party movement gains momentum, or the anti-incumbent sentiment is high. In nearly any scenario it is unlikely the Republicans could pick up enough seats to gain control of the House. But it is feasible to see them making some gains and commanding a larger role in policy making decisions. Interesting article from Stateline.org on the prospects of getting an extension of the increased Medicaid funding through an enhanced Federal Match, requiring less money to match from states, that was part of the Federal Stimulus funds. Kentucky, in its various budget proposals counted on this funding coming through and utilized this increased match to balance the budget. If this funding doesn't come through from Congress it could leave a large whole in the budget and in Medicaid. Kentucky isn't alone apparently two-thirds of states have predicated their budgets based on this funding. Time running short for Medicaid help: "States are banking that Congress will extend a piece of the federal stimulus law that is helping them pay for their Medicaid programs. Two-thirds of the states crafted budgets for fiscal 2011 assuming that more aid would come through, and as many as 19 states have no backup plan in place should it not. But with spending getting new scrutiny on Capitol Hill, the assistance may not be coming anytime soon, if it comes at all. " The Governor held a press conference in Frankfort today to address with reporters the potential impact of the state legislature not passing a state budget. The video from the press conference is below. What happens now? The Governor has said he will call a special session in May. There is nothing on the horizon that could change the fiscal dynamics. The state will still be facing a $1.5 billion deficit, gaming is still not going to pass and don’t expect any new state revenue. What are the consequences? The Governor has said a good portion of the budget he presented and both chambers adopted was predicated on restructuring debt. He believes this must be done by June 1 to be able to utilize some $120 million in the General fund and $81 million in the Road fund. He is also saying he would need 30 days to plan for any layoffs or shutdown in state government. According to court decisions the last time this happened, a Governor cannot spend money that has not been appropriated by the General Assembly. What do we think the resolution will be? We believe the continuing appropriation would be the easiest to do. Both chambers could probably agree on additional cuts to make it work. The House could give on their objection to a two year budget and allow for larger cuts in the second year knowing they will be back in January and the state financial future might improve by then. The Kentucky General Assembly adjourned the 2010 Regular Session Sine Die on Thursday evening bringing the legislative session to a close. Unfortunately, the members left town knowing that they will likely be back for a special session in the near future to deal with unfinished business in regards to the state budget. The legislature failed to pass a budget this legislative session after weeks of negotiations between House and Senate Leaders. The House and Senate made a final run at a budget compromise the last two legislative days by discussing a 1 year continuation budget. Ultimately, no agreement was reached. Based on past rulings by the courts, the Governor has very little latitude to spend money in the event that the legislature doesn't pass a budget. Only "essential" government services like K-12 education can be funded without a budget. Thus it is likely that the Governor will call the General Assembly back into session to pass a budget before the end of the fiscal year on June 30 when the current budget would expire and non-essential services would be shuttered. We will continue to dissect the legislature's work this session and the political dynamics of the budget situation and keep you updated. The General Assembly will begin its 60th and final legislative day today at Noon and as required by the constitution they must adjourn sine die before midnight tonight. The legislature worked until nearly Midnight last night finalizing action on some of the high profile bills of the session: House Bill 1, Amanda's Bill dealing with domestic violence, and Senate Bill 4 dealing with organ donation. House and Senate Leaders also spent much of yesterday in behind the scenes budget negotiations. When the session began in January, we said the biggest and most difficult issue would be the budget and how to address the 1.5 billion dollar shortfall. It is no surprise that prediction has not changed as we enter the final day. We still do not have a budget agreement. Here is the status going into the final hours. The House has proposed continuing the current biennial budget through March of 2011 with the intent of re-addressing the budget in the 2011 session. State Government would essentially continue under the same appropriation levels until the end of the 2011 Regular Session. The Senate is reviewing and did not reject this proposal immediately, although they said it does pose some problems with programs that may need or mandate increases like state health insurance and retirements. Whatever happens will happen today and we will get you updates as they are available. We have been saying for weeks that the politics of this session will revolve around the state budget. The House and Senate Leaders have essentially cut the Governor out of the budget process, after he sent the legislature a budget that was based on nearly $800 million in new revenue from expanded gaming that the legislature hadn't dealt with yet. The legislature decided to proceed their own way on the budget without the gaming revenue. It has been speculated for some time that the legislature would rely on a mix of cuts, sweeping funds, and pulling money out of Medicaid due to an enhanced Federal Match in order to balance the first year of the budget and would rely on more drastic cuts in the second year of the budget. All of this is based on the idea that the legislature will get past the November elections and force the Governor to have to deal with raising revenue in January 2011 when he is up for re-election in November 2011. With the House unveiling their budget this week it appears that the session will now begin to get underway. The Herald-Leader article below has more details on the House's budget plan. Stumbo provides broad outline of House budget plan: "
FRANKFORT — House leaders are poised to unveil a state budget proposal in coming days that cuts more than 250 political appointees, trims spending on private contractors, tinkers with the state health insurance program and delays some construction projects. House Speaker Greg Stumbo, D-Prestonsburg, also said the plan will rely on $220 million in not-yet-approved federal support for the Medicaid program. The proposal, which Stumbo described vaguely for reporters, would eliminate a projected $400 million shortfall in the first year of the two-year state budget. Much of those savings would carry over into the second year of the budget, but lawmakers still must determine how to overcome a remaining $200 million shortfall in the second year. “We have balanced in the first year, we have some carry forward actually and we are very, very close in the second year,” Stumbo said. The first year of the budget, which begins July 1, does not include any cuts to the main funding formula for schools or cuts to the state Medicaid program, Stumbo said. However, it does call for reducing the number of state workers to 2007 levels across the judicial, executive and legislative branches, Stumbo said. Specifically, Stumbo said there are about 250 non-merit positions -- political appointees -- that have been added to the executive branch since 2007." The Governor’s budget, with its reliance on gaming revenue was dead on arrival with both the House and the Senate. For the first time both chambers will be working simultaneously to develop a budget. The Governor’s budget included 780 million in gaming revenue and with the new dollars he still cut state agencies with the exception of elementary and secondary education 2% and granted teachers and state employees a 1% pay raise only if additional federal stimulus dollars come from Washington. We think this creates an environment where the legislature will seriously begin to consider tax reform or tax modernization. Begin to consider is the operative phrase here. With the November elections and most incumbents drawing opposition, anything having to do with taxes would be difficult if not impossible to consider or pass. The House will present a bill for consideration and we believe the result could be the development of a structure to begin to review and consider the state’s tax system for either a special session after the November elections or sometime next year. The leadership in both the House and the Senate has said they would be willing to look at tax reform as a way to generate more growth in revenue. Both have said they would like the state tax system to become more consumption based. Speaker Stumbo has asked a working group of legislators to draft a bill that would repeal the corporate income tax, repeal exemptions to the sales tax, apply the sales tax to services and create an earned income tax credit for the working poor. In looking at the sales tax exemptions, he has asked them to consider those exemptions that do not impact working families. On all other exemptions, many of which will impact businesses, the Speaker says they will start from scratch and expect those groups that benefit to come before the General Assembly and justify the exemptions. Here is some general information on the sales tax exemptions and how they relate to business. The sales tax is currently 6% and there are 57 exemptions not counting services. The 57 total about 2.5 billion annually, but six of the 57 make up 1.8 billion and those six would be the hardest to repeal—food, education charity and religious institutions, labor or services used in property , residential utilities, prescription medicine and cities and counties. The full list of exemptions is included as an attachment. The largest category of the sales tax that would impact our business and customers would be a new tax on services. The total if all services were taxed is 1.7 billion, but 584 million is estimated for health care which you would expect to be excluded from the list. Some of those services that would be most associated with businesses are listed below and would total 578 million. The complete list of what the state considers as services is also attached. We think you need to have your folks begin to think about the impact of losing some of the exemptions and of having the sales tax applied to various services. Obviously it will impact everyone differently. 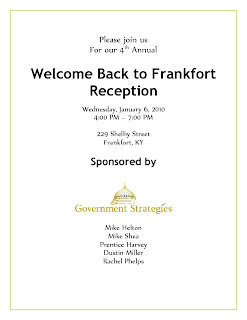 About Kentucky 01.22.2010 - LIHEAP: "
Here is our summary of the Governor's Budget Address from this evening. To see the various news articles on the budget proposal click HERE. In his budget address tonight, Governor Beshear laid out his plan for dealing with a $1.5 billion shortfall and outlining his spending priorities for the next biennium. Beshear's plan for dealing with the budget shortfall relies on over $700 million in new revenue from expanded gaming at Kentucky horse tracks. This option was one of three that the Governor considered to deal with the shortfall. The second option was for drastic cuts in the already depleted state budget; 12% the first year and 34% the second year. His third option was to raise taxes, which he was unwilling to do. Even with the gaming revenues, Beshear's budget plan still relies on cuts to state government to deal with the shortfall. He proposed a 2% cut to most state agencies, many of which have already been cut up to 12% over the last year. Even with the gaming funds this proposal includes many expenditures of one time money for recurring programs. - Primary education funding, the SEEK formula, was not cut under his proposal. - $300 million in bond funds for state highway construction and $100 million in federal highway funds for the Ohio River Bridges project. All told, the Governor tried to entice support for expanded gaming and the revenues it produces by basing his budget proposal on those revenues. Without the gaming revenues, the budget would likely include massive cuts to education and state programs that would be visible to the average Kentuckian. Politically the Governor has thrown the ball to the General Assembly and said if you don't want to pass expanded gaming, then you will have to make the deep cuts to education, health services, corrections, and public safety. Not to mention no new roads or schools. Since he was unwilling to propose new taxes and make the deep cuts to state services this may have been the Governor's only or best option at this point. We will put out a more detailed analysis of the budget proposal in the days ahead; you can access the full text of the speech HERE. About Kentucky 01.15.2010 - State of the Commonwealth: "
About Kentucky 01.08.2010 - Law Enforcement: "
Governor Beshear delivered his State of the Commonwealth Address tonight with an emphasis on jobs and bipartisanship. He outlined several initiatives he wants the legislature to tackle including: medicaid coverage for smoking cessation, stronger domestic violence laws, and changes to the higher education system. The one noticeable absence from the Governor's remarks was no mention of expanded gambling at Kentucky horse tracks. The Governor has been a strong advocate for expanded gaming legislation as it was the main issue he campaigned on when he ran for Governor. The Governor will be back before the legislature in two weeks for the Budget Address where he will present his budget to the General Assembly. Stop by our Open House on Wednesday, January 6, from 4:00-7:00 p.m. before the Governor's State of the Commonwealth Address. Plenty of food and drink to be had!! !